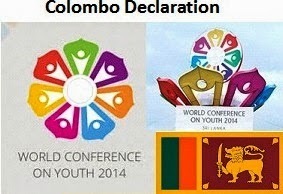 The Colombo Declaration will be unveiled at the concluding ceremony of the World Youth Conference 2014 today. The event will take place at the National Youth Services council premises in Maharagama. Discussions were held regarding the declaration for nearly 13 hours yesterday. Government representatives from 53 countries and youth community from 162 countries have extended their contributions for the preparation of the final document. Dr. Palitha Kohona representing the External Affairs Ministry has functioned as the chief moderator of the discussion. He was assisted by the Former Canadian high commissioner Mrs. Chithrangani Wagishwara. The attention was focused on issues such as gender equality, youth rights and development programmes centred on youth as well as strengthening the youth community. Preliminary talks were conducted in the past 3 days. The participant representatives have expressed their satisfaction through their twitter accounts over the ability to prepare the declaration with the agreement of youth and government delegates who attended the conference. Minister Dallas Alahapperuma says that the Colombo Declaration will be a document that would become the foundation for future global dialogues on youth. The tradition maintained up to now at the World Youth summit was the participating states and the youth groups issuing their statements separately. However, the summit of this year has been able to issue a joint declaration. The colourful concluding ceremony will be commenced at 10.30 in the morning. The Ministry of Youth Affairs and Skills development says several high ranking overseas government representatives are scheduled to participate as chief guests in this ceremony.